1. Place ingredients in order listed in a blender container. 2. Blend well until desired consistency. Note: Other types of fruit or vegetables may be substituted from those listed. Use the above list as a general guideline. If dairy sensitive, coconut milk or almond yogurt can be substituted. Feel free to experiment with putting in herbs, vanilla extract or nut butters for added nutrients. 1. Pulse together hazelnut (or almond) flour, coconut flour, salt and baking soda. 2. Pulse in dates until mixture is the texture of coarse sand. 3. Add eggs and apple cider vinegar to mixture and pulse. 4. Very briefly pulse in walnuts. 5. Transfer batter to a greased mini loaf pan. 6. Bake at 350 for 28-32 minutes. 7. Allow bread to cool in pan for 2 hours before removing. 1. Set oven to 300 and line 2 rimmed baking sheets with parchment paper. 2. Remove stems from kale by holding stem with one hand and with the other, pinching the stem at the base and slowly pulling stem toward the top of the leaves. Discard stems. 3. Wash and dry leaves thoroughly and tear into large pieces. Place leaves in a large mixing bowl. 4. Drizzle olive oil, salt, cumin and pepper over leaves and massage to coat all the kale leaves. 5. 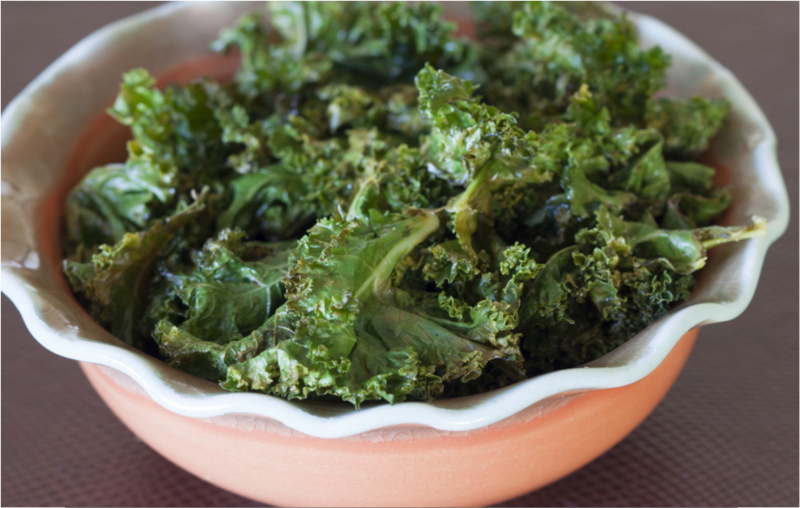 Spread kale leaves in a single layer on baking sheets. 6. Place in oven and bake for 10-15 minutes or until kale is dry, crispy and just barely brown on the edges. 7. Remove from heat. Transfer to a bowl and serve. 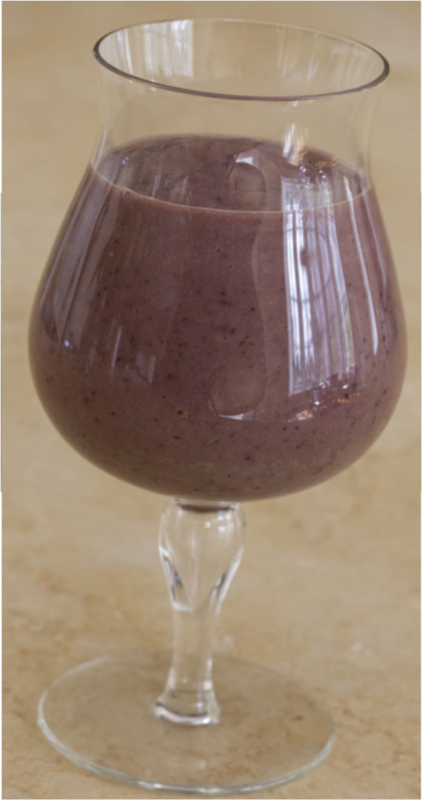 My protein smoothies are a delicious way to pack in a lot of nutrients in one easy serving. They can be consumed at breakfast or as an afternoon snack. They are quite filling. If drinking as a snack, reduce the amount to decrease the calories consumed. Remember to try chewing your smoothie instead of just drinking it. It will aid in the digestion process. The nutrition numbers below are based on the ingredients listed. As listed, this smoothie is a very good source of vitamin C and vitamin K. In addition it is loaded with the important omega 3s. It is also a good source of manganese. These smoothies have lots of fiber to support digestion and lower LDL cholesterol. The sugars can be further reduced by changing the amount of fruit used. 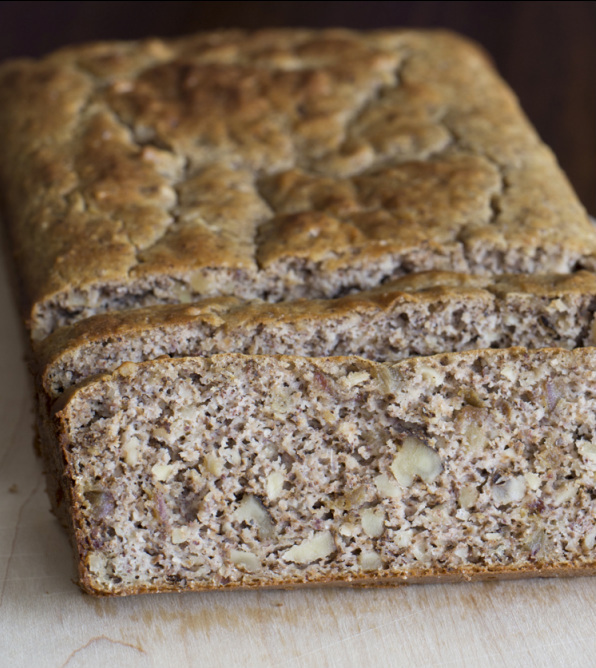 This paleo bread is an easy to prepare afternoon treat when the kids walk in the door. Since it is only sweetened with the dates, it won't be nearly as sweet as other quick breads. The walnuts provide important omega 3s that are anti-inflammatory. The bread is also a good source of manganese, selenium, some B vitamins and fiber. These kale chips are a crowd-pleaser even for those who aren't kale fans. They make a healthy alternative to chips with the benefits of added greens to the diet. Kale is high in vitamins A, C and K. In addition, these chips are a good source of vitamin B6, calcium, iron, potassium and copper. For those watching cholesterol numbers, here's a nice treat that has no cholesterol or sugar. As oven temperature may vary, check the kale to make sure it is not overcooking. You can also substitute chard as well. Be careful--once you serve these, your family will be coming back for seconds.